Founded in 1918, as the Bouchard Transportation Company Incorporated by Captain Fred Bouchard. Who had begun his tenure in the maritime industry as a Cabin Boy onboard ships sailing for China. By 1915, Fred Bouchard had become a tugboat captain in the Port of New York, New York. After the "Black Tom Explosion" on July 30th 1916. In which twenty two million dollars worth of munitions that were bound for the battle fronts of World War I were ignited. While standing watch onboard the tug C. Gallagher at Erie Basin in Brooklyn, New York. The tug was owned by the Gallagher Sand Company of New York, New York. Mr. Bouchard witnessed the explosions. Getting underway, he made his way to the site of the explosions. And despite the explosions he was successful in rescuing the Brazilian steamer the Tijoca. As well as the schooner George W. Elezy. In the aftermath, the United States District Court awarded Fred Bouchard the salvage award, as well as an additional award which totaled $9,000. He invested the salvage award to create his own company, which he named the Bouchard Transportation Company. The company's first cargo shipped was coal. In 1931, the Bouchard Transportation Company acquired their first oil barge. It was a 15,000(bbl) vessel that had sunk. Bouchard acquired the vessel for $100.00. After raising this vessel, it was towed from Jacksonville, Florida to Norfolk, Virginia. Where it was it was repaired, and retrofitted with a hot oil system. The barge was named the John Frederick. In 1951, Fred Bouchard's son, Buster Bouchard succeeded his father as President of the Bouchard Transportation Company. Under his direction the company commissioned the construction of three 20,000(bbl) oil barges, along with three accompanying tugboats. These vessels ran the New York State Barge Canal. In 1955, a third generation of the Bouchard family became involved with the company. From 1951 to 1976, the Bouchard Transportation brought many large barges into New York Harbor. From 1974 to 1978, the majority of the vessels constructed by the Bouchard Transportation Company ranged in capacity from 55,000(bbls) to 110,000(bbls). Construction continued from 1979 to 1980, with three 19,000(ton) hot oil system barges, that where constructed along with three 5,700 horsepower tugboats. 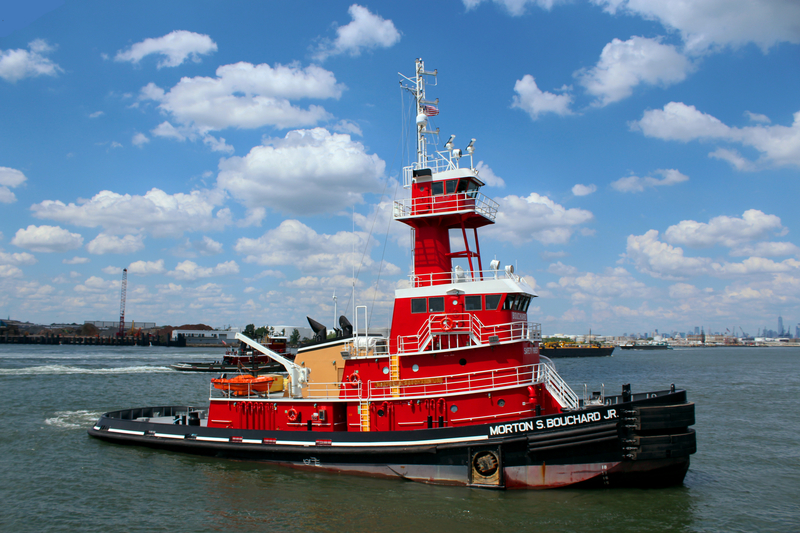 By 1989, Bouchard Transportation's fleet consisted of nineteen barges, and eight tugboats. The barges ranged in size from 18,000(bbs) to 125,000(bbls). With eight twin screw tugboats from 4,200 to 6,000 horsepower. The company extended its service routes to include coastal routes, as well as the the entire eastern seaboard, Gulf Coast, and Great Lakes. In 1992, a fourth generation of the Bouchard family assumed the company. The company faced new regulations under the Oil Pollution Act of 1990 (OPA '90). The company constructed several new 138,000(bbls), double hulled barges, with new 6,140 horsepower tugboats to move the 400(ft) barges. At the time, the new equipment was considered the largest double hulledl barge ever constructed, the B. No. 245. She was larger than 250,000(bbls). The company expanded their area of operation to include all four coast of the United States, East Coast, Gulf Coast, West and Great Lakes.